1979 has seen many sequels and prequels in video games and several new titles such as Galaxian , Warrior and Asteroids . Galaxian is an arcade game that was developed and published by Namco and released to the Japanese market in October 1979. In December, it was imported to North America by Midway. The game is a fixed shooter in which the player controls a spaceship at the bottom of the screen and shoots enemies descending in various directions. It was designed to compete with the success of Taito Corporation's earlier game, Space Invaders. Warrior is a 1979 arcade fighting game. It is considered one of the first fighting games, excepting several boxing games such as Heavyweight Champ, released in 1976, and Atari's unreleased Boxer. Asteroids is an arcade space shoot 'em up game released in November 1979 by Atari, Inc., and designed by Lyle Rains, Ed Logg, and Dominic Walsh, before being ported in the 1980s to a number of Atari consoles. The player controls a single spaceship in an asteroid field which is periodically traversed by flying saucers. The object of the game is to shoot and destroy the asteroids and saucers, while not colliding with either, or being hit by the saucers' counter-fire. The game becomes harder as the number of asteroids increases. The US market for arcade games earns a revenue of $1.5 billion  (equivalent to $5.18 billion in 2019). Activision Publishing, Inc. is an American video game publisher based in Santa Monica. It currently serves as the publishing business for its parent company, Activision Blizzard, and consists of several subsidiary studios. As of January 2017, Activision is one of the largest third-party video game publishers in the world and was the top publisher for 2016 in the United States. Capcom Co., Ltd. is a Japanese video game developer and publisher known for creating numerous multi-million selling game franchises, including Street Fighter, Mega Man, Resident Evil, Devil May Cry, Monster Hunter, Sengoku BASARA, Ace Attorney, Onimusha, Breath of Fire, Okami, as well as games based on the Disney animated properties. Established in 1979, it has become an international enterprise with subsidiaries in North America, Europe, and Japan. Edu-Ware Services, Inc. was an educational and entertainment software publisher established in 1979 by Sherwin Steffin and Steven Pederson It was known for its adventure games, role-playing video games, and flight simulators for the Apple II family of computers. April, Sega's dot-eating driving game, Head On , is released. It becomes a popular concept to clone, especially for home systems. October, Namco releases fixed shooter Galaxian in full color. August, Atari releases Lunar Lander , the first arcade version of a game concept created on minicomputers ten years earlier. November, Atari releases the vector graphics-based Asteroids , which becomes Atari's second best selling game of all time and displaces Space Invaders as the most popular game in the US. November, Vectorbeam releases Tail Gunner , a space shooter with a first-person perspective. December, Nintendo releases Radar Scope , featuring a pseudo-3D, third-person perspective. Later, 2000 out of 3000 manufactured machines are converted to Donkey Kong. Cinematronics releases Warrior , one of the first fighting games without a boxing theme. Sega releases the vertically scrolling Monaco GP , featuring full color and day/night driving. It is one of Sega's last discrete logic (no CPU) hardware designs. Sega Games Co., Ltd. is a Japanese multinational video game developer and publisher headquartered in Tokyo, Japan. The company, previously known as Sega Enterprises Ltd. and Sega Corporation, is a subsidiary of Sega Holdings Co., Ltd., which is part of Sega Sammy Holdings. Its international branches, Sega of America and Sega of Europe, are respectively headquartered in Irvine, California and London. Head On is an arcade game released in 1979 by Sega. Cars continuously drive forward through rectangular channels in a simple maze. At the four cardinal directions are gaps where a car can change lanes. The goal is to collect dots in the maze while avoiding collisions with the computer-controlled car that is also collecting dots. It's the first maze game where the goal is to run over dots, and Head On is considered a precursor to Namco's 1980 hit Pac-Man. Namco Limited is a brand and corporate name used from 1971 to 2018 by two Japanese companies in the businesses of video games, game centers and theme parks. The name continues to be used outside of Japan by the subsidiary Namco USA. October, subLOGIC releases Flight Simulator for the Apple II. Richard Garriott creates Akalabeth , a computer role-playing game for the Apple II. It launches Garriott's career and is a precursor to his highly successful Ultima series. Atari, Inc.'s 8K Star Raiders cartridge is released and becomes a system seller for the new Atari 400/800 computer line. Epyx, Inc. was a video game developer and publisher active in the late 1970s and 1980s. The company was founded as Automated Simulations by Jim Connelley and Jon Freeman, originally using Epyx as a brand name for action-oriented games before renaming the company to match in 1983. Epyx published a long series of games through the 1980s, but nevertheless went bankrupt in 1989 before finally disappearing in 1993. Temple of Apshai is a dungeon crawl role-playing video game developed and published by Automated Simulations in 1979. Originating on the TRS-80 and Commodore PET, it was followed by several updated versions for other computers between 1980 and 1986. A role-playing video game is a video game genre where the player controls the actions of a character immersed in some well-defined world. Many role-playing video games have origins in tabletop role-playing games and use much of the same terminology, settings and game mechanics. Other major similarities with pen-and-paper games include developed story-telling and narrative elements, player character development, complexity, as well as replayability and immersion. The electronic medium removes the necessity for a gamemaster and increases combat resolution speed. RPGs have evolved from simple text-based console-window games into visually rich 3D experiences. December, Atari Adventure for the Atari 2600. It is the first action-adventure game and has one of the first known Easter eggs. Atari SA is a French corporate and brand name owned by several entities since its inception in 1972, currently by Atari Interactive, a subsidiary of the French publisher Atari, SA. The original Atari, Inc., founded in Sunnyvale, California in 1972 by Nolan Bushnell and Ted Dabney, was a pioneer in arcade games, home video game consoles, and home computers. 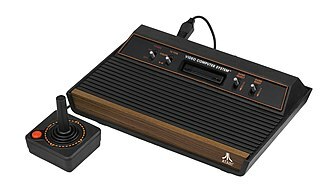 The company's products, such as Pong and the Atari 2600, helped define the electronic entertainment industry from the 1970s to the mid-1980s. Adventure is a video game for the Atari 2600 video game console, released in late 1979–1980. In the game, the player controls a square avatar whose quest is to explore an open-ended environment to find a magical chalice and return it to the golden castle. The game world is populated by roaming enemies: three dragons that can eat the avatar and a bat that randomly steals and hides items around the game world. Adventure introduced a number of innovative game elements to console games, including a playing area that spanned several different screens and enemies that continued to move even when not displayed on the screen. The Atari 2600, originally sold as the Atari Video Computer System or Atari VCS until November 1982, is a home video game console from Atari, Inc. Released on September 11, 1977, it is credited with popularizing the use of microprocessor-based hardware and games contained on ROM cartridges, a format first used with the Fairchild Channel F in 1976. This contrasts with the older model of having dedicated hardware that could play only those games that were physically built into the unit. The 2600 was bundled with two joystick controllers, a conjoined pair of paddle controllers, and a game cartridge: initially Combat, and later Pac-Man. June, Texas Instruments releases the TI-99/4. It is the first home computer with a 16-bit processor and, with TI's TMS9918 video chip, one of the first with hardware sprites. September, NEC releases the PC-8001, the first in the PC-8000 series of home computers. November, Atari, Inc. releases the first two models in the Atari 8-bit family: the Atari 400 and Atari 800 home computers. They feature custom graphics and sound coprocessors which support sprites, four-channel audio, and programmable display modes. Texas Instruments Inc. (TI) is an American technology company that designs and manufactures semiconductors and various integrated circuits, which it sells to electronics designers and manufacturers globally. Its headquarters are in Dallas, Texas, United States. TI is one of the top ten semiconductor companies worldwide, based on sales volume. Texas Instruments's focus is on developing analog chips and embedded processors, which accounts for more than 80% of their revenue. TI also produces TI digital light processing (DLP) technology and education technology products including calculators, microcontrollers and multi-core processors. To date, TI has more than 43,000 patents worldwide. The Texas Instruments TI-99/4A is a home computer, released June 1981 in the United States at a price of $525. It is an enhanced version of the less successful TI-99/4 model, which was released in late 1979 at a price of $1,150. Both models include support for sprites and multi-channel sound, some of the first home computers to include such custom hardware, alongside the Atari 8-bit family also introduced in 1979. NEC Corporation is a Japanese multinational provider of information technology (IT) services and products, headquartered in Minato, Tokyo, Japan. It provides IT and network solutions to business enterprises, communications services providers and to government agencies, and has also been the biggest PC vendor in Japan since the 1980s. The company was known as the Nippon Electric Company, Limited, before rebranding in 1983 as NEC. Mattel test markets the Intellivision console in Fresno, California. It is released throughout the United States in 1980. November, Milton Bradley Company releases Microvision, the first handheld game console. The Atari 7800 ProSystem, or simply the Atari 7800, is a home video game console officially released by the Atari Corporation in 1986. It is almost fully backward-compatible with the Atari 2600, the first console to have backward compatibility without the use of additional modules. It was considered affordable at a price of US$140. Arcadia 2001 is a second-generation 8-bit console released by Emerson Radio in May 1982, several months before the release of ColecoVision. It was discontinued only 18 months later, with a total of 35 games having been released. Emerson licensed the Arcadia 2001 to Bandai, which released it in Japan. Over 30 Arcadia 2001 clones exist. The history of video games goes as far back as the early 1950s, when academic computer scientists began designing simple games and simulations as part of their research or just for fun. At M.I.T. in the 1960s, professors and students played games such as 3D tic-tac-toe and Moon Landing. These games were played on computer such as the IBM 1560, and moves were made by means of punch cards. Video gaming did not reach mainstream popularity until the 1970s and 1980s, when video arcade games and gaming consoles using joysticks, buttons, and other controllers, along with graphics on computer screens and home computer games were introduced to the general public. Since the 1980s, video gaming has become a popular form of entertainment and a part of modern popular culture in most parts of the world. One of the early games was Spacewar!, which was developed by computer scientists. Early arcade video games developed from 1972 to 1978. During the 1970s, the first generation of home consoles emerged, including the popular game Pong and various "clones". The 1970s was also the era of mainframe computer games. The golden age of arcade video games was from 1978 to 1982. Video arcades with large, graphics-decorated coin-operated machines were common at malls and popular, affordable home consoles such as the Atari 2600 and Intellivision enabled people to play games on their home TVs. During the 1980s, gaming computers, early online gaming and handheld LCD games emerged; this era was affected by the video game crash of 1983. From 1976 to 1992, the second generation of video consoles emerged. A video game console is a computer device that outputs a video signal or visual image to display a video game that one or more people can play. Zaxxon (ザクソン) is a 1982 isometric shooter arcade game, developed and released by Sega, in which the player pilots a ship through heavily defended space fortresses. Some sources claim that Japanese electronics company Ikegami Tsushinki also worked on the development of the game. A sound chip is an integrated circuit designed to produce sound. It might do this through digital, analog or mixed-mode electronics. Sound chips normally contain things like oscillators, envelope controllers, samplers, filters and amplifiers. During the late 20th century, sound chips were widely used in arcade game system boards, video game consoles, home computers, and PC sound cards. The fifth-generation era refers to computer and video games, video game consoles, and handheld gaming consoles dating from approximately 1993 to 2002. For home consoles, the best-selling console was the PlayStation (PS) by a wide margin, followed by the Nintendo 64 (N64), and then the Sega Saturn. The PlayStation also had a redesigned version, the PSOne, which was launched in July 2000. 1983 has seen many sequels and prequels in video games and several new titles such as Mario Bros., Pole Position II and Spy Hunter. Sprite is a computer graphics term for a two-dimensional bitmap that is integrated into a larger scene. 1994 has seen many sequels and prequels in video games and several new titles such as Super Metroid, Donkey Kong Country and Sonic & Knuckles. 1989 has seen many sequels and prequels in video games and several new titles such as Phantasy Star II, Golden Axe, Mega Man 2, and Bonk's Adventure. 1985 saw many sequels and prequels in video games and several new titles such as Gradius, Super Mario Bros. and Duck Hunt. 1982 was the peak year of arcade and console games during the Golden age of arcade video games. Troubles at Atari, Inc. late in the year triggered the North American video game crash of 1983. Many games were released that would spawn franchises, or at least sequels, including Dig Dug, Pole Position, Mr. Do!, Pitfall!, Q*bert, and Xevious. Additional consoles add to a crowded market. The new Commodore 64 goes on to eventually dominate the 8-bit home computer market. Fueled by the previous year's release of the colorful and appealing Pac-Man, the audience for arcade games in 1981 became much wider. Pac-Man influenced maze games began appearing in arcades and on home systems. Nintendo broke from their mediocre early releases with Donkey Kong which defined the platform genre. A dedicated console is a video game console that is dedicated to a built in game or games, and is not equipped for additional games, via cartridges, discs or other media. The second decade in the industry's history was decade of highs and lows for video games. The decade began amidst a boom in the arcade business with giants like Atari still dominating the market since the late-1970s. Another, the rising influence of the home computer, and a lack of quality in the games themselves lead to an implosion of the North American video game market that nearly destroyed the industry. It took home consoles years to recover from the crash, but Nintendo filled in the void with its Nintendo Entertainment System (NES), reviving interest in consoles. Up until this point, most investors believed video games to be a fad that has since passed. In the remaining years of the decade, Sega ignites a console war with Nintendo, developers that have been affected by the crash experiment with the superior graphics of the PC, and Nintendo also releases the Game Boy, which would become the best-selling handheld gaming device for the next two-decades. A home video game console, or simply home console, is a video game device that is primarily used for home gamers, as opposed to in arcades or some other commercial establishment. Home consoles are one type of video game consoles, in contrast to the handheld game consoles which are smaller and portable, allowing people to carry them and play them at any time or place, along with microconsoles and dedicated consoles. The 1970s saw the development of some the earliest video games, chiefly in arcade versions, but also several for the personal computer and the earliest games consoles. ↑ Scorpia (October 1991). "C*R*P*G*S / Computer Role-Playing Game Survey". Computer Gaming World. p. 109. Retrieved November 18, 2013. ↑ "List of Top Sellers". Computer Gaming World . 2 (5): 2. September–October 1982.